Browse our complete collection of Tungsten Wedding Rings! 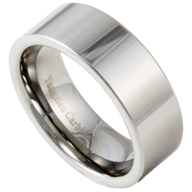 Our Tungsten Bands are guaranteed to be genuine Tungsten Carbide, and are 100% cobalt free! These rings are extremely strong, scratch resistant, and their luster will last a lifetime. This page will have our complete collection of tungsten rings to choose from, and all of them come with a free ring box and are eligible for our Lifetime Warranty! Click here to learn more about Tungsten! Ring Ninja's Tungsten Ring prices are the best you'll find - add that to our Lifetime warranty and our Tungsten Rings are an amazing value! The majority of these rings can be engraved and shipped the same day that your order.